Kitchens Are Monkey Business: Rosie Makes Shrimp Summer Rolls. Rosie Makes Shrimp Summer Rolls. I'm making summer rolls today. To be specific, shrimp summer rolls. "Rosie, what's a summer roll? an egg roll, or a spring roll?" I'll try to explain as best I can. An egg roll is usually a savory wheat flour roll (made with egg) filled with shredded cabbage, pork, and other fillings (including thin strips of cooked shredded egg), and fried in hot oil. The egg roll wrapper is a thick wrapper and is heartier than a spring roll. Here's my egg roll recipe, in case you're interested. It's worth a click on the link. A spring roll is made of rice paper filled with vegetables and meat, rolled into a cylinder, and fried. Spring rolls have a thin, almost translucent wrapper. 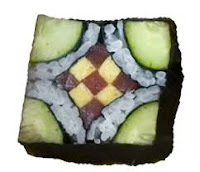 A summer roll is a fresh spring roll, kind of like a salad roll, unfried, and wrapped in parchment-thin rice paper. At least, those are my definitions, but what do I know? I grew up eating spring/summer rolls, and many other kinds of rolls as well. I know Vietnamese food best, so this answer will be specific to Vietnamese style spring/summer rolls although I believe the answer applies across the board. Most other types of similar rolls are a derivation of the Vietnamese originals anyway if I’m not mistaken. The terms spring/summer roll are just random translations of a food item that in Vietnamese does not contain the words summer or spring at all. Therefore, what is a spring roll at one Vietnamese restaurant will be known as a summer roll at another or an imperial roll at yet another restaurant. None of these translations is right and none of them is wrong either. Others are saying that a spring roll is fried and a summer roll isn’t. This is false as far as I’m concerned. It’s like trying to translate the word “taco” into English. There is no equivalent. There is no good name for a taco in English other than taco and if there was an attempt at translation, who would be the authority on such translations anyway? The reality is that someone just decided that “summer roll” would be a good translation of the Vietnamese translucent roll (not fried), the most well-known one being gỏi cuốn in the Vietnamese language. Someone else decided they liked “spring roll” better. Yet someone else went with “imperial roll.” For me the best translation of the original Vietnamese term would be “salad roll,” but this translation is used only rarely as it doesn’t sound quite as appetizing (at least not to me). The fried roll is known as either chả giò or nem rán depending on where you’re from in Vietnam. I’ve also seen these randomly translated as spring, summer, or imperial rolls. Sometimes, they clarify by calling them (deep-) fried spring/summer/imperial rolls. Again, none of these is right and none of these is wrong. Neither of the Vietnamese terms for the fried roll contains the words spring/summer/imperial or even the word roll for that matter. We’re talking about using very loose descriptive terms to translate otherwise untranslatable terms. If you’re in a restaurant and you need clarification on a menu item, the best thing for you to do is ask or read the description. I myself just default to the Vietnamese terms, so there is never any confusion. Btw, another answer stated that the translucent kind usually don’t come with meat. This is false too. Traditionally, gỏi cuốn, the most well-known translucent rolls, do always come with sliced pork in addition to chilled shrimp. 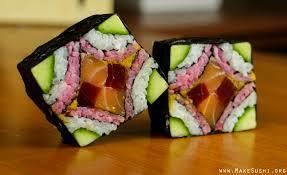 In fact, some (very popular) translucent rolls if not most versions come with meat only, no shrimp. Just so there's no confusion, I'll be making Rosie Rolls. It is summer and they have shrimp in them, so I think I'm making Shrimp Summer Rolls. Whatever you want to call them, they're light, they're fresh, they're refreshing, and they're just plain good. As I said, one might call these "salad" rolls. Because they're filled with salad fixin's. julienned carrots, cucumbers, red peppers, scallions, mint, and basil. Not shown: my assorted greens from the garden - a tender, young, leafy mixture of salad/mesclun greens. If you don't grow your own greens, use a soft lettuce leaf like bibb, butterhead, arugula, oak leaf, or spinach. Not shown: cooked shrimp, sliced. Other fillings you might consider: assorted sprouts, radishes, avocado, rice noodles, shredded cabbage, mushrooms, tofu, cilantro, crab meat, bamboo shoots, water chestnuts. You also need some sushi rice. And some sushi vinegar. Sushi rice is a short grain white rice containing a high percentage of starch which makes the grains sticky and perfect for sushi rolls. Regular white rice has been milled and processed, so it doesn't become as sticky when cooked. Which brings me to sushi and sashimi. What's the difference? Sushi is made up of a combination of ingredients, most notably nori, or seaweed, with the common thread being rice dressed with vinegar. Sushi always has rice. Sashimi is thinly sliced raw seafood that's often used in sushi rolls. To prepare the rice, I followed the directions on the container. I rinsed 1 cup rice in a strainer until the water ran clear, drained it, then put it in a pot with 1 1/4 cups water. I brought it to a boil, then reduced the heat, covered, and simmered for 15-20 minutes. Ended up with about 3 cups cooked rice. Removed it from the heat and let it stand for 10 minutes. Then I stirred in 3-4 tablespoons of the rice vinegar. Dipping sauces are a must. For my wrappers, I use this rice paper. Rice paper used for Vietnamese food is traditionally made from just rice, water, and salt. They are one of the unique aspects of Vietnamese cooking and dining, and food wrapped up in sheaths of translucent rice paper is utterly charming. Aside from looking pretty and holding a bunch of goodies together, they contribute chewy texture and a slight tang to whatever they encase. and set one sheet of rice paper in the water. Rice paper, as you can see, is very delicate. It doesn't need long in the water to soften, maybe 20-30 seconds. Long enough to make it pliable. and won't be able to roll it at all. Then I added a layer of sticky, vinegared, sushi rice. And then a layer of sliced, cooked shrimp. Now, add on your julienned vegetables. I used mint and basil. Working quickly, roll up the paper. I like to slice the rolls on the diagonal. I also made a third sauce. And just give me some time to practice. I'll be creating kaleidoscopic visions in no time! Rosie Loves Her Coconut Fried Shrimp. Rosie Loves Her Corn Bread. Rosie's Go-To Dish - Corn/Bean Tortilla Pie. Rosie Makes "The BEST" Blueberry Muffins.